The recent tragedies of gun violence have resulted in a renewed interest into the role of violent video games and aggressive, anti-social, and violent behavior. The current view is that many young people who commit violent crimes do so because they play violent video games. In some ways, this is like saying that the use of suntan lotion increases the likelihood of drowning. In research, this is called a spurious correlation. A spurious correlation consists of two events or variables that have no direct causal connection–such as suntan lotion and drowning. C (a third factor such as antisocial traits and depression) cause both A and B. No relation view: that any correlation between the video game playing and aggression is due to underlying third variables such as depression and anti-social traits–C causes both A and B.
Ferguson (2010) controlled for these three views. Aggressiveness and video game violence use do not seem to be highly predictive of one another (Ferguson 2010). For children with low antisocial traits, media violence exposure was associated with less criminal behavior. The simple explanation: kids who are home playing games are more likely not to be out of the home getting into trouble. Antisocial children who are most inclined toward criminal behavior may also be those most likely to select violent media. Additionally, it may be that only the most antisocial children will be affected by media violence exposure leading to aggressive behavior and violent crimes. This is the explanation favored by Ferguson et al. (2008) based on similar ﬁndings as well as by Kutner and Olson (2007). This should not be underestimated. More research is needed to understand this, but as Giumetti and Markey (2007) alternatively suggest that, although violent video games are harmless for the vast majority of children, for those with preexisting high antisocial traits, video game violence may exacerbate these traits. More research on this is definitely needed. The No-Relation View: third variables that predicted serious aggression and violence – C (depression anti-social traits) causes both A (violent aggressive behavior) and B (choosing violent games). The evidence provided by Ferguson (2010) indicates that playing violent games does not lead to violent aggressive behavior.Instead, there was more evidence for the “No Relation” Hypothesis. That Games did not lead to the aggressive/violent behavior. Instead, it was evidence suggested that antisocial traits and depression predict violent and aggressive behavior. When outcomes from the Child Behavior Check List were calculated for effect size, (the strength of the phenomenon), depression and symptoms of pathological aggression were seen as strong effects(.5, .62) as well as for bullying (.32). Also when depressive symptoms and antisocial traits combined (appeared to interact), individuals with high antisocial traits who also were depressed were most likely to engage in aggressive and criminal acts. Thus, aggression and video game violence have little causal impact on each other (Ferguson 2010). But antisocial traits, depression, and violent games make for a dangerous combination. So why do studies of violent video game play show increased aggression? Why do we see behaviors such as frustration, anger, anxiety after our children play games? There may be a other factors at play: competitiveness. So is it the content, or the level of competitiveness? Quite honestly, I have noticed this same competitiveness leading to aggression in pickup basketball, political discussions on Facebook, and staff meetings about budgeting office supplies. The best predictor of violence and aggressive behavior is better predicted by competitiveness, anti-social traits, and depression. This is may be compounded when all three of these factors are present. Additionally, it is important to point out that people with depression are not typically viewed as potential risk for violence. Depressed patients can display a set of symptoms called anger attacks, where they will have tantrums, or anger outbursts. But this rarely is associated with violence. It is of greater concern when the individual has other anti-social traits, or diagnosis such as when depression is compounded with anti-social traits and a competitive context. My fear with games would be that children who are already socially isolated in public (excluded –relational aggression), and also may exhibit anti-social traits, may also isolated at home. Although games can provide a sort of coping mechanism, but they can also present a distraction for not dealing directly with an issue. Conversely, having an enjoyable activity may support the individual in a time of challenge and provide an effective coping mechanism that supports them in conjunction with dealing directly with an issue. There may be a happy medium here. Games are currently being tested as clinical tools for such areas as PTSD and Schizophrenia. Additionally, most children see gaming as an inherently social act. The social networks surrounding games as interaction, community, and social currency cannot, and should not be underestimated for mental health evaluation and treatment interventions. 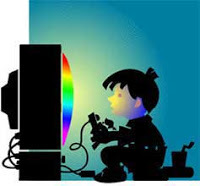 Games are very engaging, but online gaming communities represent a very narrow bandwidth for communication. When we look at contemporary society, we see people more connected with media. Although that connection represents an increase in communication, it represents a limited bandwidth for expression and communication. Sherry Turkle describes this as being “alone together”. Games can be a modern convenience. They keep kids home, they keep them engaged, and they allow adults to engage in their own chosen activities. But letting kids disappear into the basement or their rooms for long periods to play games may not be for the best–this can be especially true for children with the challenges of anti-social traits. The sustained engagement in games may be tempting for many parents, but it can also lead to isolation and further issues when left unchecked. I suggest that parents, friends, husbands and wives, attempt to engage. Don’t diminish the video game play. Valorize it. Ask to understand, engage as a supporter, and participate and interact. You may soon be playing with this person you were concerned about, and extend this into interaction, socialization, and conversation–reducing isolation and depression.